FUMARASE (or fumarate hydratase) (EC 4.2.1.2) is an enzyme that catalyzes the reversible hydration/dehydration reaction of fumarate to malate. 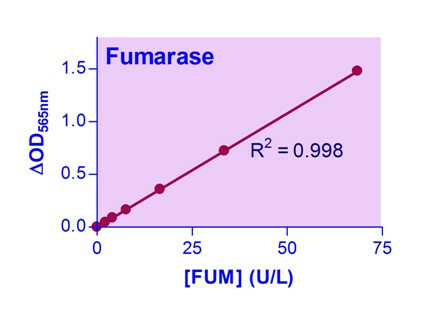 Fumarase exists in two isoforms: a cytosolic and mitochondrial form. In the citric acid cycle, it facilitates a transition step in the production of energy in the form of NADH. Fumarase deficiency in humans results in early brain development problems and is characterized by poor feeding, hypotonia, failure to thrive, etc. BioAssay Systems’ non-radioactive, colorimetric fumarase assay is based on the reduction of the tetrazolium salt MTT in a NADH-coupled enzymatic reaction to a reduced form of MTT which exhibits an absorption maximum at 565 nm. The increase in absorbance at 565 nm is proportional to the enzyme activity. Applications For quantitative determination of fumarase enzyme activity.